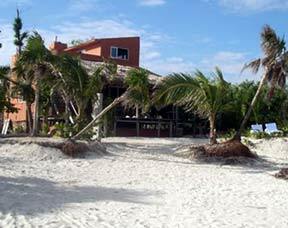 If you prefer the privacy of a secluded beach front house instead of a hotel Mayan Beach Garden Reservations offer Costa Maya villas and homes for rent in the area south and north of Mahahual. All are beach front, privately owned and perfect for those wanting something off the beaten track. NOTE: all houses are "off the grid" in every sense and use alternative energy and water sources. Costa Maya Villas are the only on-grid property. Costa Maya's most spacious rental property! Rated a 10! Las Brisas del Caribe- Great Family home - great price for 3-4 bedroom home on a great beach. Mahahual's most unique home - rent the entire Villa or only one room if you choose. Two bedroom home on Sapphire Beach in Placer North. Three bedroom Designer's home built to take advantage of the view. Includes a beach level rental studio that can be rented out individually. Mahahual's first Luxury Beachfront Condos.Two bedroom luxury condos with A/C, large pool and Beachfront. Located between the Lighthouse and Costa Maya Pier. Casa de Azucar Great family beach house - great location ! Lots of upgrades on this house - rent now before price goes up!! 7.5 km N. of Uvero Beach Club - 2 bedroom with optional cabana. NOTE: these homes are not on the electricity grid and use alternative water and energy sources.